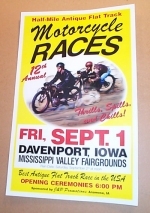 One of the major events at the Davenport meet are the Friday night races. They have an excellent facility including a grandstand and oval dirt track. It was my goal to get down into the pits but no one seemed to know how to get there or even how to get a ticket. So we found a seat and looked forward to the show getting as close to the track as possible for a few good shots. To view an event such as this gives you different perspective on motorcycle racing. Like a time machine, it thrusts you back to a time when full throttle racers flew around tracks made from boards, crouched down to become a part of the machine just to gain that little bit of extra speed by cutting down on the resistance to the wind, heads up hugging the gas tanks they roared by us with open pipes, some smoking and chugging, adjusting as they go. The leader of the pack straining to get a glimpse of where his rival is, and the pour it to her look on their faces tells you that to them, this is serious business. But I think that it is more than just winning. Its a victory of putting an old piece of iron back on the track where it belongs. Its a commitment to the rebuilding skills a the fix for the addiction to speed and the joy of the tuners art. They just want to squeeze just one more ounce of power out of their machines, gain an edge and the sweet smell of victory. I think they are just plain having a blast of a time. Rounding the corners kicks up the dust and dirt, side by side pressing each other almost unaware of the possible danger of connecting with each other at 80 plus miles per hour. But to them must seem like straight ahead focus looking for the short line to the checkered flag. Here's a brief race report straight from Jim: Won the board track again, would have been a good one but the guy that was running with me lost a tire. It was Rusty Lowry of GMA fame on a Harley 8 valve and we where having fun. Disapointed with the Scout came in 6th, felt like I was going backwards. Fooled with the cam timing to much as it plain sucked power wise. Will run it on the dyno again for a baseline and switch things back to the way they where. Oh well next year I guess. Full story on Jim's 1928 boardtrack racer here! Jim Wall has been racing vintage bikes since 1989, mostly on dirt tracks, and has frequently ended up in the winners' circle. Jim also won the boardtrack race at Davenport last year. Before taking up Indian racing, Jim was an MX racer. There's a Laconia Scout (vertical) waiting at the back of the Wall garage. Expect to see Jim race on pavement when this bike is done. Jim Wall going outside Larry Semler on the HD to take the lead -and eventually the win in the boardtrack, experienced class. Thanks to Joe Riley of the AMCA Chief Blackhawk Chapter and to Jim Wall for filling in some details. The races are sponsored by J&P Cycles. The pack roaring 'round the corner. More Davenport Racing Pix by Mark Dowis! -Kicking the dirt, looking for traction..
Ready... -See the results above! Wanna go racing? HD (sorry) boardtracker for sale. You can also build your own 741/Sport Scout racer. Check out part one of Craig Cate's "741 Racer or Hot Sreet Stroker" series in this issue.